Just when you think that puzzle games can’t push you further than what’s already been presented by so many countless games, you come across that one game that adds additional elements to push the formula even further. The original Q.U.B.E. 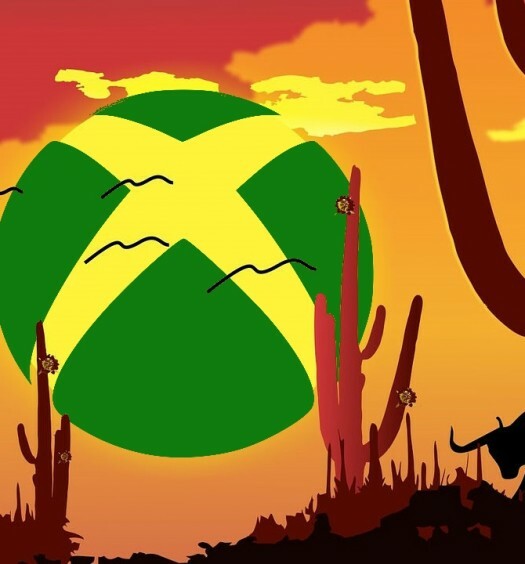 didn’t grace Xbox gamers until July 2015, though what we were presented with was well worth the wait. 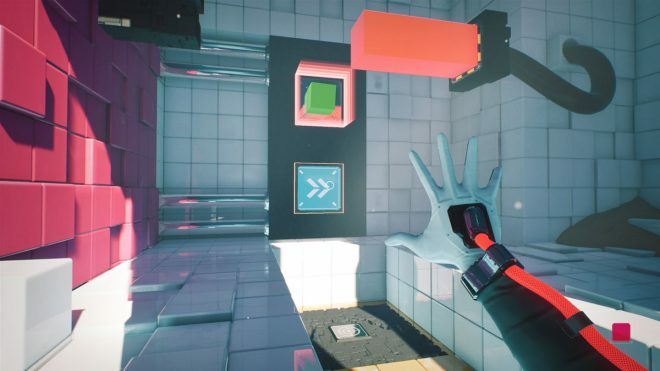 Q.U.B.E is a puzzle game that gives players the ability to place and manipulate five different colors with their gloves each with a unique function. Using these elements, while at the same time interacting with the environment around you, makes for some pretty impressive solutions. The story was memorable in the sense that your character was contacted continuously through voice communication by two different people both telling you different stories as to what is happening around you. Every interaction pushed you to further question who was telling you the truth and who was lying up until the very end. 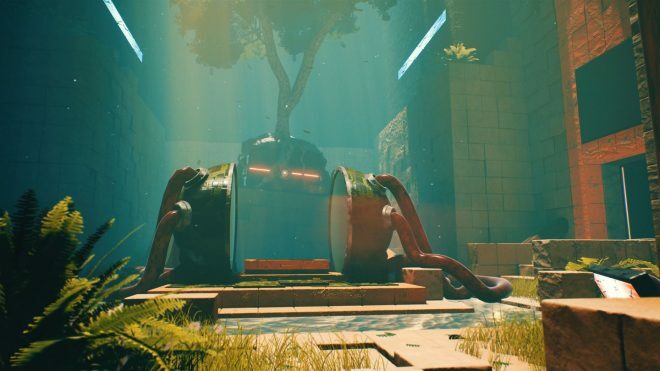 Now almost three years later, Toxic Games returns with the stunning sequel, Q.U.B.E. 2, in an attempt to further question not only how much more advanced puzzle games can get, but what exactly happened in the first game. From the start, you play Amelia Cross, an archaeologist, who awakens to find herself in the confined corridors of an ancient alien structure. Amelia, confused as to her whereabouts, is immediately contacted thru voice transmission by another survivor, Commander Emma Sutcliffe. Sutcliffe attempts to guide Amelia from a distance; advising her on what she needs to do if she wishes to attempt an escape from this place. Equipped with a unique suit and powered gloves, Amelia quickly learns she can use colors taken from machines to manipulate specific ground and walls around her. With this power and the direction of Emma, Amelia pushes forward and upward for answers. Manipulation Overload – Players are quickly reintroduced to the color powers from last game. This time around there are only three colors to manipulate. The blue color acts as a jump pad. The red color extends out a platform. The green color spawns a cube. We also see the return of different interactable environments. Some players may remember the original Q.U.B.E. included walls that when interacted with would cause a squared section of the room to be rotated. Shifting walls that move horizontally or vertically replace that particular design, acting as a more polished concept to the overall formula. Some rooms even have switches laid out with a variety of different interactions. Some will activate platforms or elevators, while others activate a grease stream that coats object’s and gives them mobility. Q.U.B.E. 2 starts out so familiar and quickly reveals some of the newer elements added to the game to help it step up. Some of the later levels even give you the ability to play with fire. “Hello my name is…” – The original Q.U.B.E. was wonderful. Every minute of it was memorable, but the one complaint many people had was that the main character was both voiceless and nameless. You were being led forward by a woman over voice transmission. Later, another voice would communicate back and forth with the player and advise them that the other woman was lying and everything this new voice had to say was the truth. These plot points really helped players keep focus until the end of the game but weren’t nearly as developed as they could have been. Q.U.B.E. 2 fixes this complaint with the addition of the protagonist Amelia Cross who speaks and has a fully fleshed out personality. It makes your character feel human and alive, unlike the lifeless robot from the first game. Furthermore, you get a bit of backstory around the character and her husband which helps bring them to both life even more. Tie-In – One worry a player should have when it comes to a sequel to a video game is whether or not the developer will choose to completely forget about the events of the previous game. This can leave questions that players had regarding the previous game to go unanswered. Thankfully Q.U.B.E. 2 quickly steps in to educate about the events of the first and how players have advanced to where they are now. The mention is brief at first, but as you advance through the game later interactions and plot points will be presented to further tie the original game to the sequel. Not brain busting – A lot of puzzle games tend to amp up the difficulty from 1 to 10 in a short period. The original Q.U.B.E. took baby steps with the player to help them understand the power they had been given, and how to manipulate it. Toxic Games follows this same example in Q.U.B.E. 2 by making sure to add a bit of depth and difficulty to each puzzle, but not enough to where it causes a player to be stuck for longer than they should have to, preventing overcomplexity from causing a disconnect from the story. Whenever the player encounters a new element, the game has a specific set of rooms that orchestrate a general idea of how that element works. After that, the player is split into separate rooms that could add a few more elements from previous puzzles. It’s rather interesting on how well it helps the game to flow. Personally, players will most likely have trouble with the final puzzle more than any others in the game. No puzzles stop you to the point to where you don’t want to continue. Some of the more complex puzzles at a later point in the game can make you feel like a genius just by how quickly you string together the solution. Observing a puzzle and identifying the start and end points can really help you to pinpoint what all needs to be done. 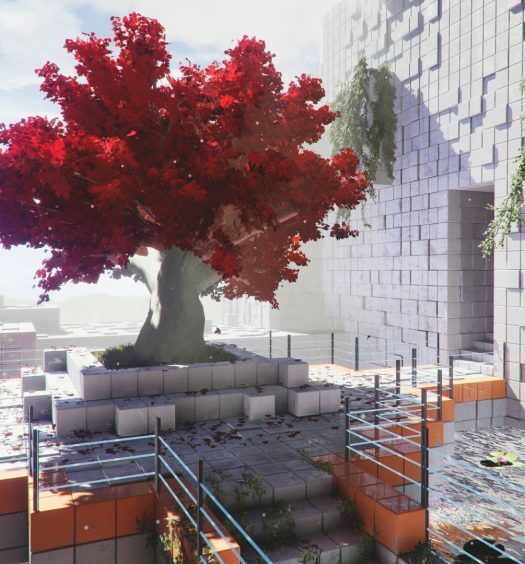 Accessible Gaming – A new feature added to Q.U.B.E. 2 to help make the game accessible to everyone is the addition of colorblind mode. The original Q.U.B.E. was a fantastic game that was hard for some players to commit to due to the necessity of the six colors and the inability to divulge between them. When the mode is active, the colors have different shapes overlapping to help better distinguish which blocks you are manipulating. Blue has a circle, green has a square and orange has four-cornered arrows pointing inward. Switches also have varied patterns depending on the type. Pressure plates requiring weight to activate are striped, while switches that only need to be stepped on to enable have two arrows pointing up and down similar to elevator buttons. There’s also a jump assist feature that may help those having trouble with identifying where they are jumping (for any reason). Subtitles – In regards to the gameplay of Q.U.B.E. 2, everything the game brought to the table is golden, both new and old. The only complaint about the game (and a very small one at that) comes from the subtitles. During later parts of the game, your character converses back and forth with an artificial intelligence. During this time, it can be difficult to understand some of what the artificial intelligence is saying to the point you may decide to turn on subtitles. The text displayed by subtitles appears a lot smaller than it should be to the point a player would need to either have very good eyesight from far away or be sitting right next to their screen to read the text. While it can be understood not wanting the subtitles to disrupt the game by getting in the way, at their present size it can hinder the experience for the gamer who plays with little to no sound or for those hard of hearing. Having played the game sitting close to a 24” monitor and a 32” television heeded relatively the same result. If there was an increase in the size of the text, it was minuscule. Q.U.B.E. 2 isn’t exactly what you’d wanted it to be; it completely surpasses what you’d want with a game. 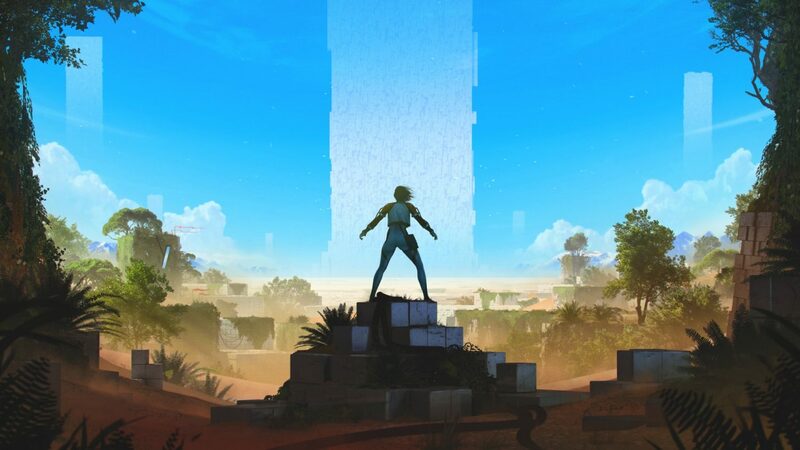 The game doesn’t only present itself as a sequel; it breaks through a threshold of expectations for a sequel. Q.U.B.E. 2 is a game that’s well worth the time and money spent. 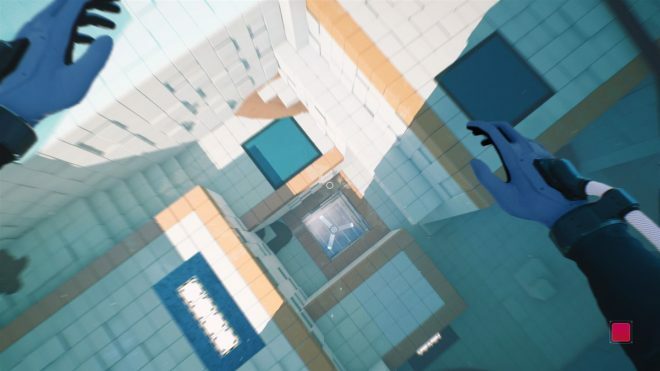 Even for those who haven’t gotten the chance to experience the original game, Q.U.B.E. 2 does a great job of filling the player in on the important details that lead up to this point. If you’re in the mood to test your brain against some exciting puzzles all while experiencing an interesting and phenomenal story, then look no further. Q.U.B.E. 2 is developed by Toxic Games and published by Trapped Nerve Games. The game released on March 13, 2018, for $24.99. A copy was provided for review purposes.